This window display features a 1950s-era wedding gown affixed to the wall with hundreds of “T” pins, its storage box and tissue papers on the floor. 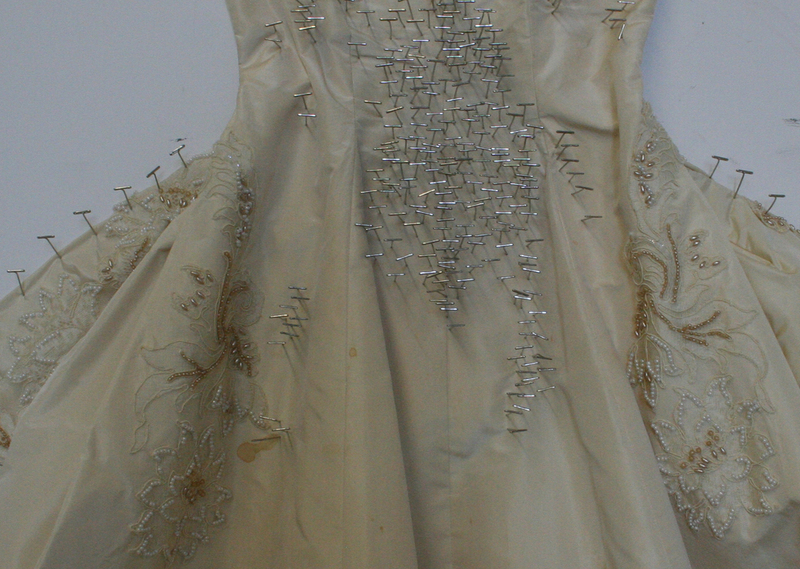 The gown’s pearls, its stains, and the use of the pins pay homage to the beauty and struggles of both brides and women artists of generations past. It considers how social, transitional moments are defined, in part, through adornment, display, and constraint. Saved as artifacts imbued with personal and cultural history, the unpacking of memorabilia, in turn, (re)constructs and informs knowledge and beliefs about the past.